I thought I would start a devblog for my latest project, Holy Suit. See my previous post for more information on the inception of the project & stay tune for more Holey Suit Devblog! 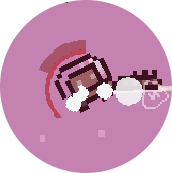 I started work on holey suit in early July, originally as a prototype for GMTK Jam. From there it grew into a fun, standalone project which I decided to finish as a quick break from Dungeon Scroller. The game is best described as a “epic space survival stealth physic-ish”, although it is quite a mouthful! 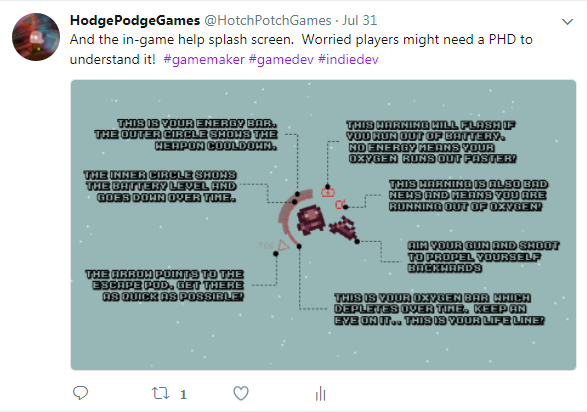 My plan is to release Holey Suit to itch.io for free in the coming month(s), and see how well it performs on the platform. As this is the first post of the Holey Suit devblog, let’s focus on initial progress: a month and a half in, how have things gone? Disclaimer: I work solo outside my full time job and make a point of doing everything myself from scratch. That means I juggle between development, art, music and PR. How is that going? Surprise surprise, solo game dev as a spare time hobby is rather snail paced! In a previous post, I explained my approach to maximise time spent on the game, and learned how to restrict scope with the “go for the simplest choice” design philosophy. Holey Suit is a great project to apply these due to small scope of the game. It is a nice feeling to realise experience gained from previous projects is paying off! I think I managed to cram in just under 40 hours so far on the project and the build increasingly starts looking like a finished product. The limited scope of the game, a straightforward action game, certainly helps. All the art was done with Pixartu on my iPad when I have a spare minute, and lately I have been composing the music on my way to and from work. So despite only working on it sporadically, it is making steady progress! As you’ll see from the screenshots, the art is bare bones and minimalist on purpose. Putting the base art together (characters, aliens & space debris) was done in a matter of hours, and in the later phase of development adding a new asset takes minutes. I just hope this won’t put people off! Music is produced on the same lines; I am using Garage Bands and loops. So far I came up with a title song and working through the in-game music. Loops are a neat way to quickly put together something that sounds professional – although unlikely unique! Development-wise I am doing my best to fight scope creep, and doing a good job so far. The game scope has remained relatively unchanged from day 1, and if anything I lately have simplified some of the mechanics! The fact the game is articulated around a single, simple mechanic makes scope control really easy. One of my drivers behind finishing this project is I am quite invested in Dungeon Scroller, and do not want this to be the first game I push out of the door. Essentially Holey Suit for me is testing the waters, and see how much I can get the game noticed. Unfortunately, that means spending much more time on PR that I would like! The Holey Suit devblog is part of that strategy. I try to regularly tweet about the game, but somehow think it is not carrying as much weight as Dungeon Scroller. First realisation: Holey Suit’s graphics aren’t exactly flashy and therefore don’t get much traction. My plan is to go increasingly more public with the project. More twitter posts, animated GIFs, a trailer at some point, and a series of Holey Suit devblog posts starting with this one. I already spent a lot of time on the itch.io page, to make sure the page looks as good as possible. The poor in-game graphics will have to wait until I have an alpha build, but I have a few ideas to try out! Another concern is the nature of releasing a free game. I hear a lot of complaints that the market is saturated for paid games – I feel this is even more the case for free games! Itch.io is a great platform for jams, but as a result flooded with jam entries and hobby projects. Even if Holey Suit is a finished product, I am concerned it will be hard for it to stand out. I guess I’ll write mote on that matter in future Holey Suit devblog. One thing I learned from the shenanijam is how important getting people to play your game is. Every time I have an opportunity to do so, I show the latest build to my friends and watch how they play the game. One major flaw surfaced: players don’t seem to understand what they are meant to do in the game! Quite problematic. 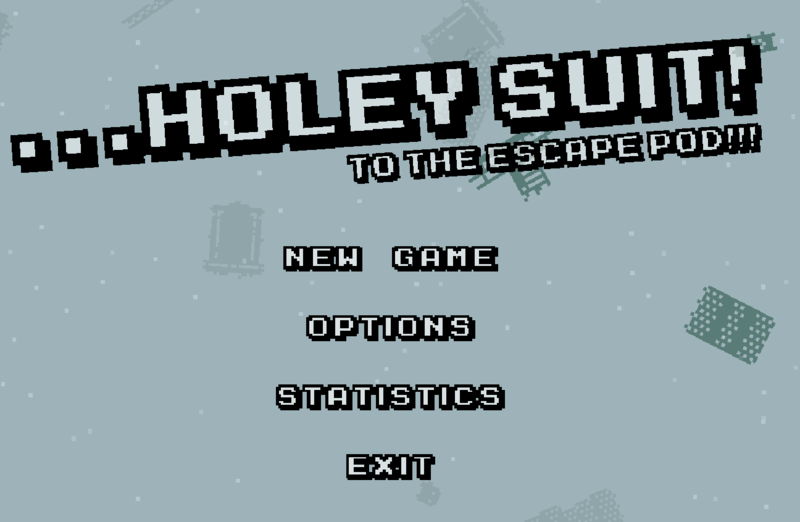 I thought the game name (Holey Suit, to the escape pod!) would make it obvious. It does not. Nearly everyone did not get that they had to follow the HUD arrow (most people didn’t notice it either) which points to the pod. Also to my surprise, most didn’t distinguish the crates, which you are meant to pick up, from the debris, which you are meant to avoid. One person thought they could be mines and avoided them on purpose! And finally, the death screen didn’t really communicate to the player how well he/she did on that run. Definitely more info would be needed there to convey a sense of progress. In the previous post I discussed my design choices, or precisely how I wanted to push the player to play a certain way. To force the player to pick up crates, I came up with a complex mechanic where the player’s battery capacity reduces in time, forcing him/her to swap weapons and reset the battery max charge. This turned out to be quite obscure to monitor, or even understand. That hit me strongly, especially in view of my first round of play testing. I therefore decided to simplify the energy mechanic. There are now two bars to monitor: energy (which regenerates) and oxygen (which depletes). Both are independent from each other, and essentially the energy bar acts more as a weapon cool-down than anything else. The full energy is restored on picking a crate, so there is still an incentive to pick them up. Another comment was on the game difficulty: it is hard by design, but I felt from the play test sessions it was punitive at times. To balance things a bit, my plan is to add game modes. The classic mode has oxygen bottles the player can pick up to extend gameplay. The HUD also points to the closest crate & O2 bottle so the player constantly has a choice. Sprint to the escape pod, or make a detour to grab a O2 bottle? The eternal dilemma! I was genuinely worried the game rules required a PHD to get it! I never thought it would ever be the case, but I quite enjoyed working on the menu for Holey Suit!!! My take on the menu was to make it dynamic. Sprinkle some debris floating in the background and superimposed text. First step was to find a suitable font, which I luckily found quickly. I was looking at what font Vlambeer used for Super Crate Box and found something similar. I wanted the game to have the same arcade feel to it: Karmadic Arcade fitted the theme nicely. Getting the menu text from images was a bit tedious so I quickly looked at a way of using the font in game maker. I stumbled on font_add_sprite_ext which does exactly what I needed! The rest came up quickly. It also forced me to rethink a bit how I would handle unlocks (unlocking character will be a big thing in the game) and the various game modes. I also had a quick go at trying out different screen sizes and resolutions. Originally the game resolution was square (1280 x 1080) because of this video from Vlambeer (part 1: we made a game but it had an issue). But somehow, in Holey Suit the resolution never felt right. I tried the full screen approach, and holey moley – does the game look better!!! I’ll definitely stick with wide screen going forward. Even though the point conveyed by Rami is perfectly sound, it doesn’t feel good with Holey Suit. – Holey Suit devblog. Won’t write itself! At this point in the project I am planning to post a lot more on progress. – In game music. I am currently trying to put something “atmospheric” together with garage band. – Sound FX. Still not quite sure how the aliens will sound, but some kind of Ack Ack Ack Ack Ack is a possibility! – Unlocks. WIP – more on that in the next blog post. – Statistics. On of the menu page will be a recap of aliens killed, how many crates picked up etc. – Better death screen. I have an idea for a “à la Nuclear Throne” screen. – Tutorial. *sigh* no escaping this one! Any comments? Feel free to post away! 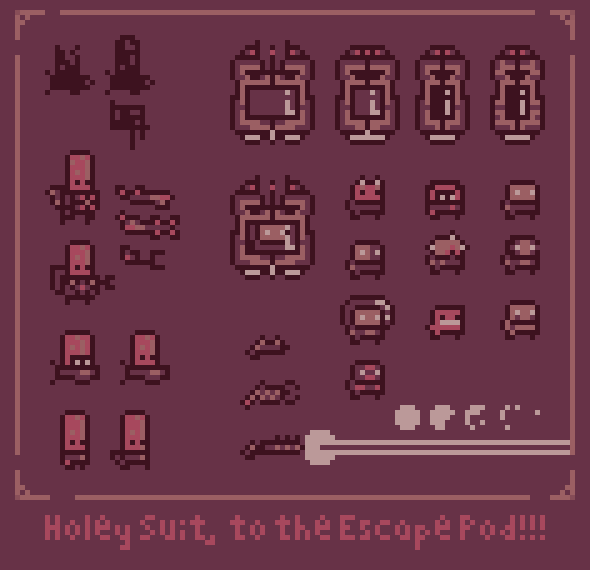 Previous Post: Holey Suit, to the escape pod!